We looked at data from our own Nudge app users to see how two distinct groups stacked up against one another over their first 120 days using Nudge. Includes Nudge app users who are NOT connected with a health or fitness coach in Nudge and (1) track their lifestyle manually in Nudge, (2) track their lifestyle using another app or wearable that syncs into Nudge, or (3) do both. Includes Nudge app users who ARE connected with a health or fitness coach in Nudge and (1) track their lifestyle manually in Nudge, (2) track their lifestyle using another app or wearable that syncs into Nudge, or (3) do both. so what difference does adding a connected health pro make? "These technological advances will forever change the way the health and fitness professionals create value and serve their clients. I can’t recommend strongly enough that now is a time more than ever to get ahead of this wave, before you get left behind." 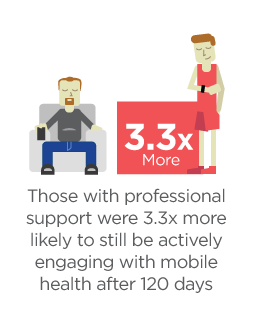 "Mobile health takes fitness coaching to a whole new level. Tracking my clients daily behaviors and activity has not only enhanced accountability, it has enhanced my ability to guide them towards their goals more effectively!"